Sally A. Brown is Princeton Seminary’s Elizabeth M. Engle Associate Professor of Preaching and Worship. She has an MDiv from Gordon-Conwell Theological Seminary and a PhD from Princeton Theological Seminary. An ordained Presbyterian minister with more than 20 years of parish and nonparish pastoral experience prior to beginning her academic career, she continues to teach and preach in local congregations. 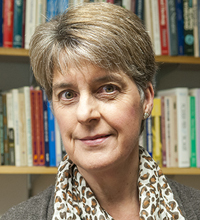 Her academic interests include the theology and rhetoric of the cross in contemporary preaching, with attention to issues raised by feminist theology and postmodern theories of discourse; exploring the history, theology, and rhetoric of women’s preaching in a range of cultural contexts; identifying trajectories of continuity and change in worship today, with attention to the what and why of Christian worship, theologically, as well as the difference context makes in worship practices; and hermeneutical theory and constructive practical theology. She teaches preaching and worship as well as a PhD seminar in theories of interpretation and constructive practical theology.